PEM Surface Creations provides slip-resistant flooring and wet area mats for safety and comfort to the golf, aquatic, marine, equestrian, sports, and yoga industries. Since 1997, PEM Surface Creations has grown to become the premium choice for slip resistance and comfort from simple slip-resistant matting applications, to major aquatic events throughout the world, as well as every application in between. The soft construction and unique porous looping design creates a durable textured surface to reduce slippage in well traveled areas and to provide padding on points of harmful contact. PEM slip resistant flooring is produced in many thicknesses and colors to meet the requirements of your specific application. It all comes down to the design. 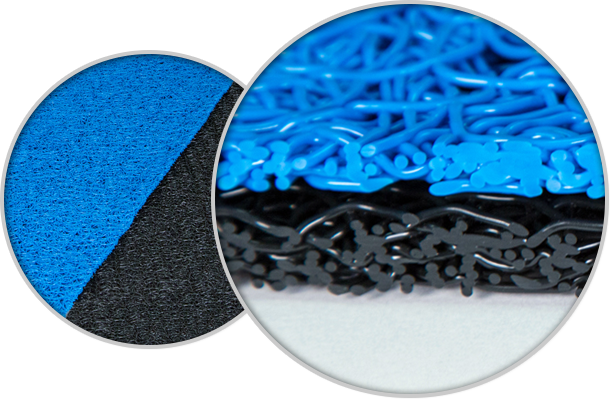 The unique vinyl loop matting (or spaghetti matting) was developed to provide added slip resistant to frequently wet areas. The porous construction drains and dries quickly, making it the ideal solution for both indoor and outdoor applications.